[30minutes] Helicopter tour in TOKYO and YOKOHAMA!! You can visit Yokohama Minatomirai from Tokyo by the helicopter. Leave the Tokyo heliport and see Rainbow Bridge, Odaiba, Tokyo Tower, Tamagawa, Minato Mirai etc. It is an attractive plan that you can see sightseeing spots in Tokyo and Yokohama and beautiful Gulf Coast and townscape at the same time. You will have fun in both Tokyo and Yokohama! This plan is very popular with our customers. 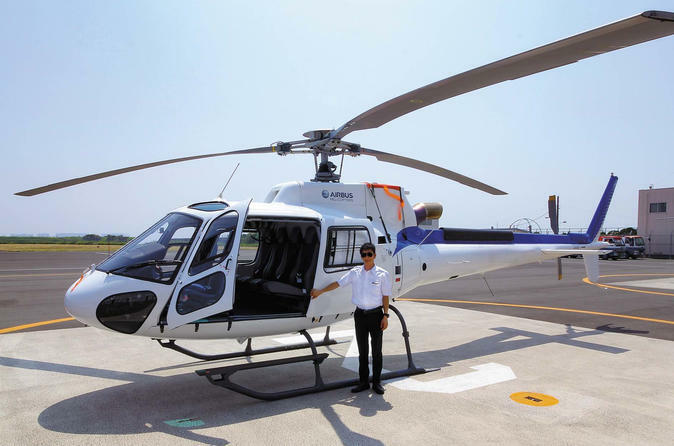 Experience the best views of Tokyo from inside a 30 minute helicopter ride, with large windows and featuring 600 meter panorama view! After finishing the orientation (approx. 30 mins), get ready to take off from Tokyo Heliport and fly over some of the most symbolic landscapes in Tokyo including Odaiba, Rainbow Bridge, Tokyo Tower, Meiji Shrine, Shinjuku Gyoen Park, Rikugien Park, Ueno Zoological Gardens and Tokyo Sky Tree, and more. The helicopter ride will be approx. 30 mins and the beautiful view of Tokyo will make it the most unforgettable moments for your trip!